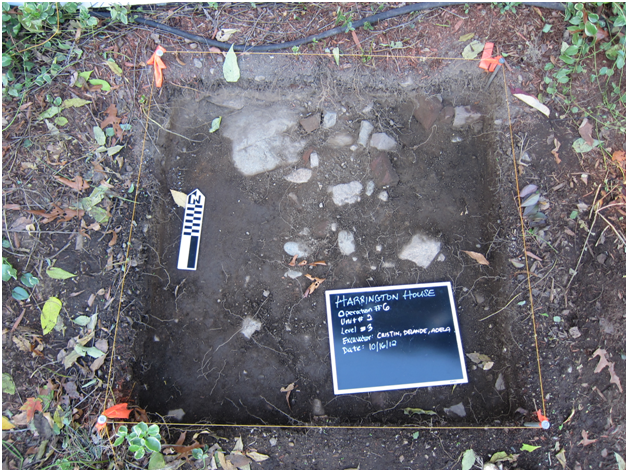 This class focused on the excavation of specific dig sites at the Samuel Harrington House, which today is the site of Brandeis' Rabb School of Continuing Studies at 475 South St, Waltham, MA. 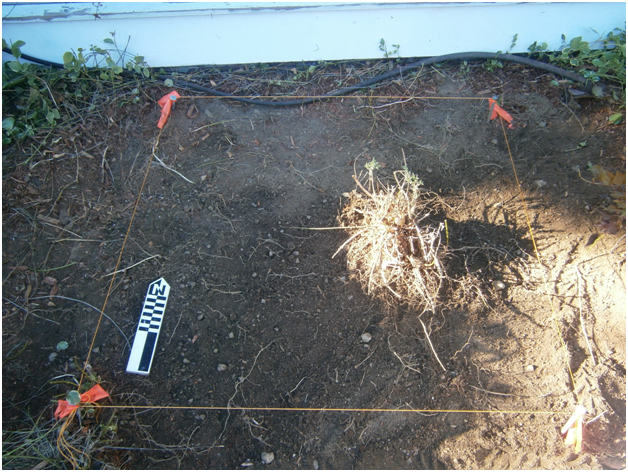 It was a very interesting hands-on course as we were able to go through the steps of setting up a unit (1 square meter), and learned about various topics like soil stratigraphy, the local history of Waltham, how to properly dig a site in a level way with a trowel, methodology of modern archaeology and the use of modern technology like laser rangefinding scanners (LIDAR), to name a few. A Georgian style house that has been renovated several times, the Harrington House retains some of the key features of the Georgian architecture such as the extra-wide wooden floor boards and large fireplaces. 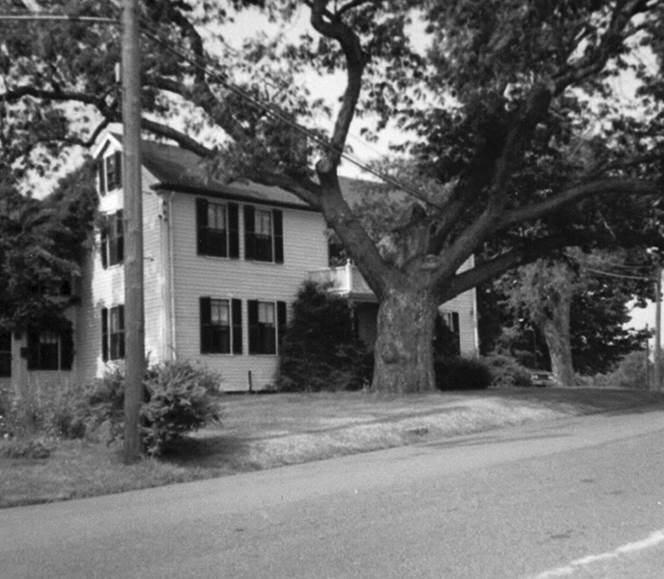 Robert Harrington was the first of the Harrington family to be recorded in the New England area. 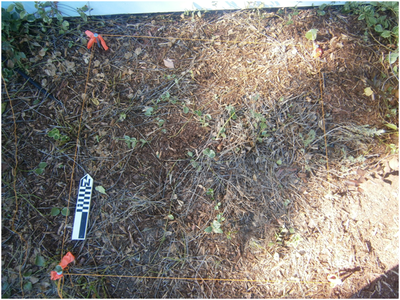 He was the one to acquire the land that the house stands on today, which consisted of about 250 acres of land. In his will he split the land between his two sons (they were the only two out of seven who survived to maturity), which is how half the land came to his son, Captain Samuel Harrington. Capt. 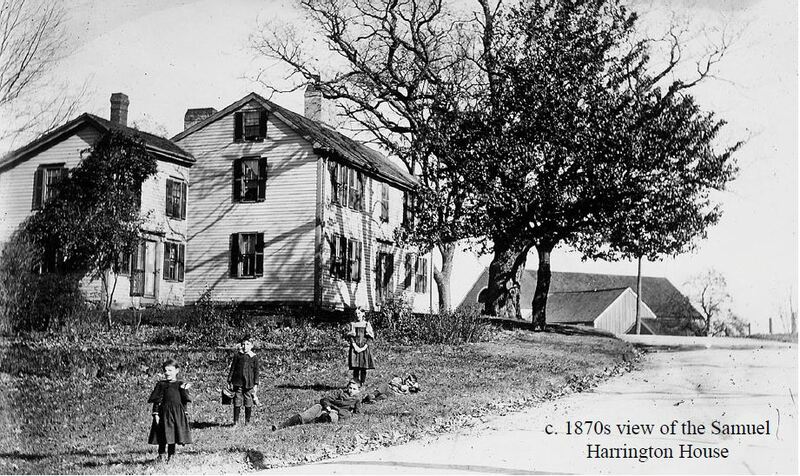 Harrington was living on a different plot of land in a house that no longer stands, as records show that Waltham gave Samuel Harrington permission to make bricks at the clay pits in 1691. 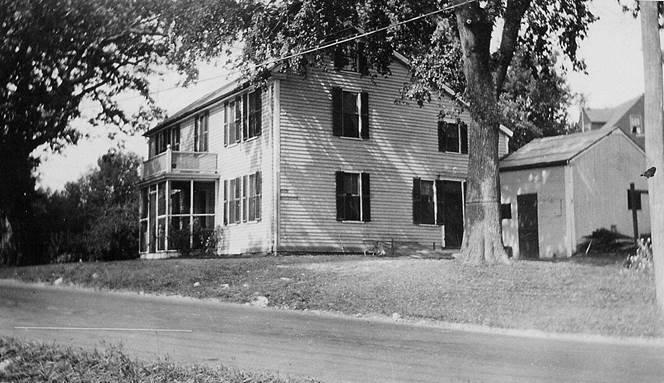 It is likely the current house was built by Capt. Harrington's grandson, Samuel Harrington IV, who married in 1739. 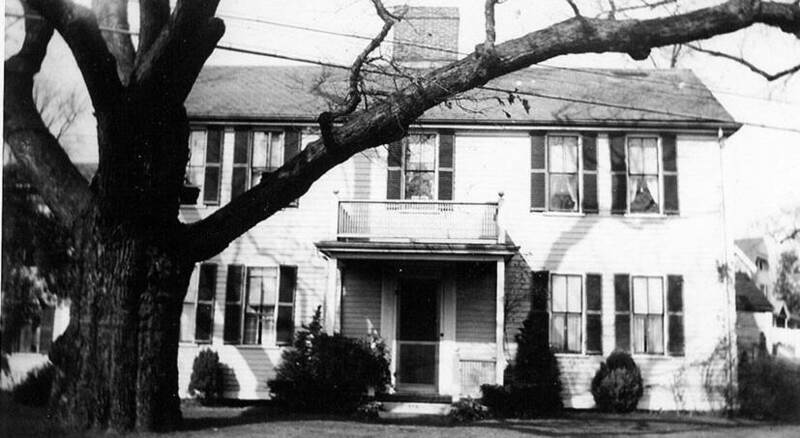 The house was first recorded in 1793, as the deed for the house and land was transferred to his son, Samuel Jr. The Harrington House has been through several modifications, and since the landscaping and front exterior of the house has changed, we weren't sure what we would find in our unit to the east side of the front door. 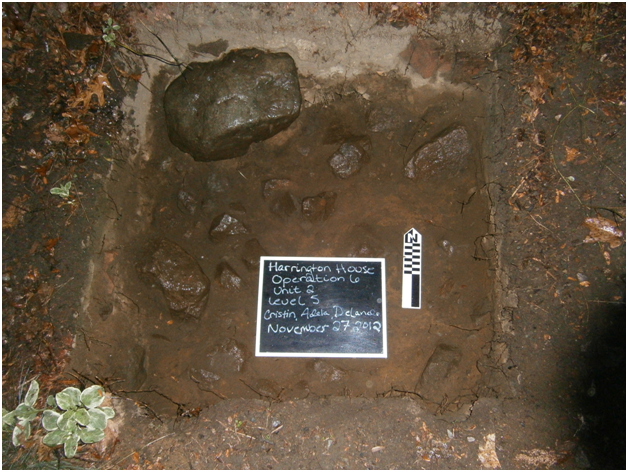 Hypothesis: Although some believe the house was built in the late 18th century, we feel that our findings will prove the Samuel Harrington House was constructed in the mid-1700s. A picture of our excavation site before we started. We were assigned this specific unit in the front of the house because we hoped to find items that might have been swept out the front door of the house. 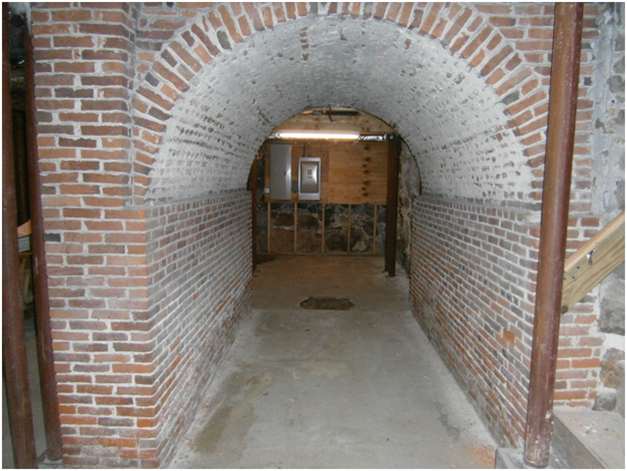 The unit (Operation 6, Unit 2) at the end of level 5, looking at the west wall. Nails: possibly from the front porch that was added to the house, as they date to the early 1900s and the porch was added in 1906. Likely the nails are from the removal rather than the installation of the porch. Slate: most likely from the roof of the house, although no early photographs show an indication of slate roofing. 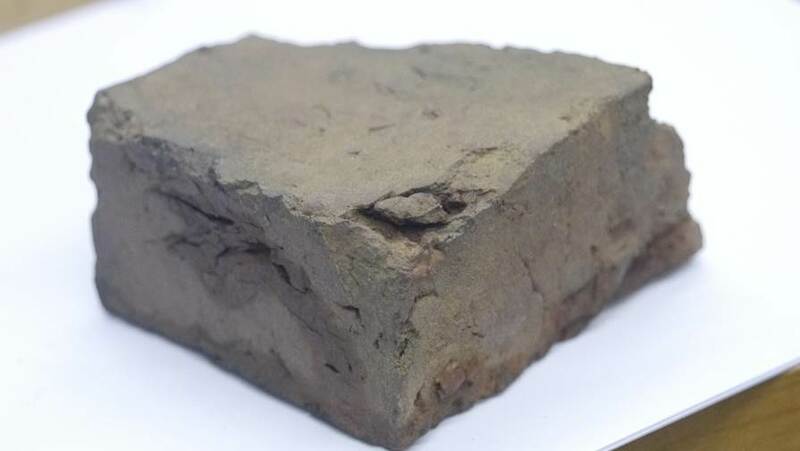 Slate found in the basement is of a different color and thickness than that found in the unit. 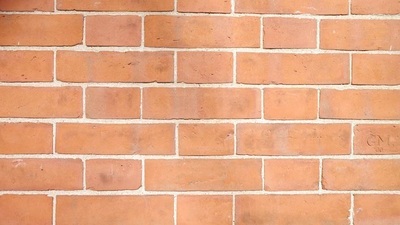 Bricks: most likely from the chimney or the basement. 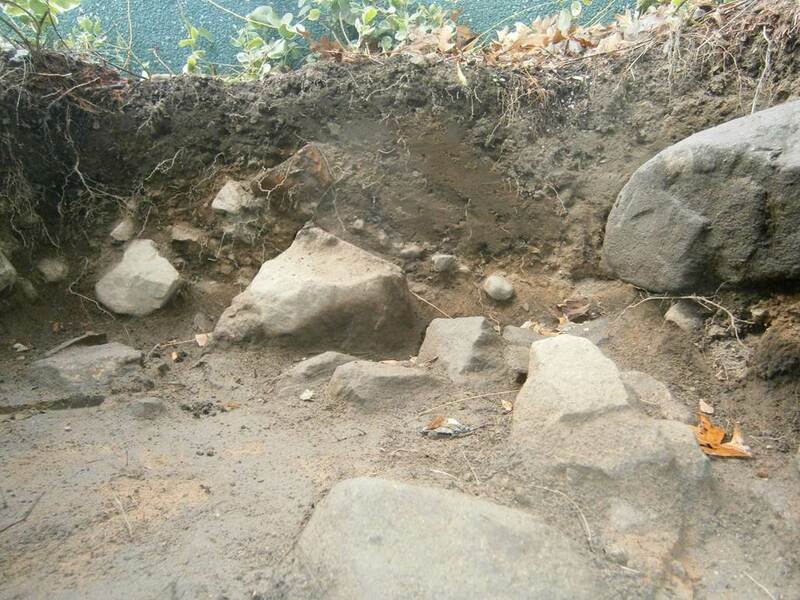 Over the course of our dig, we found 144 fragments, and speculate they may have come from a collapse of the chimney. Bricks found in the foundation are of a different size but do correspond with those in the chimney foundation. 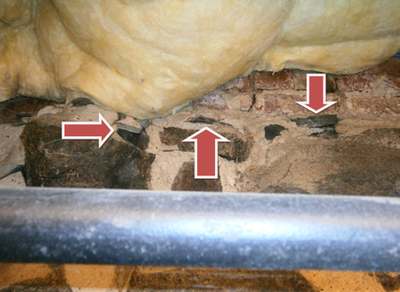 It's possible a chimney collapse could have caused slate on the roof to fall as well. 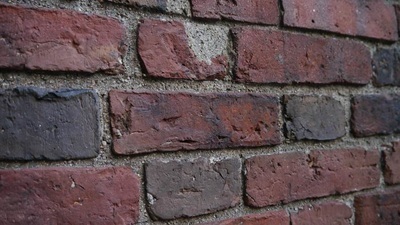 When Cahn surveyed the house in the mid 1970s, the brick foundation was still visible. 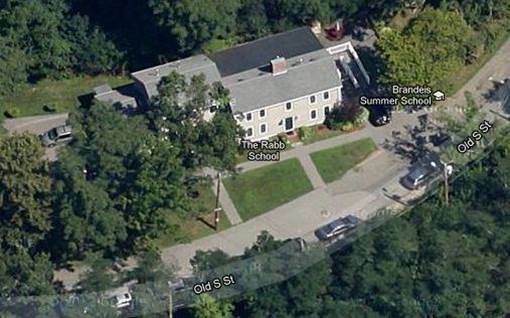 Today the foundation has been covered up and it's quite likely that the void we saw in our unit could have been caused by landscaping done after the house was purchased by Brandeis University. 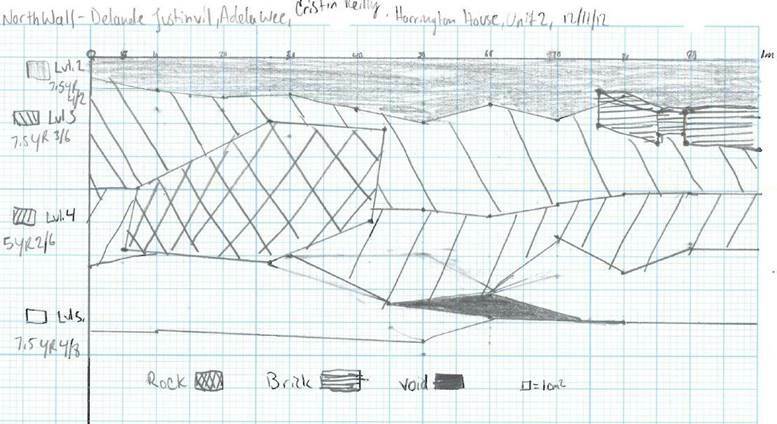 Alternatively the void could have signified a larger foundation, as there were many rocks visible inside of it. 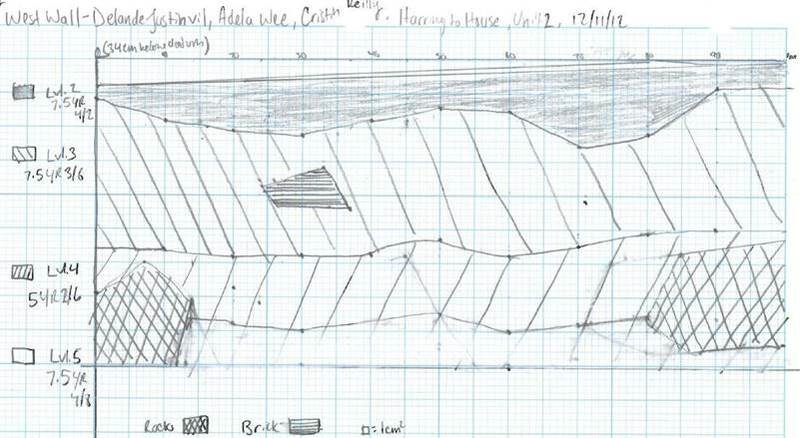 Profile drawing of the west wall of our unit, showing the embedded brick and rocks in the wall. Illustration of a type B cut nail, produced from 1810-1900s. A cut nail found in level 4. Believed to be a type B cut nail, produced from 1810-1900s. Slate found in the foundation, visible from the basement of the house. 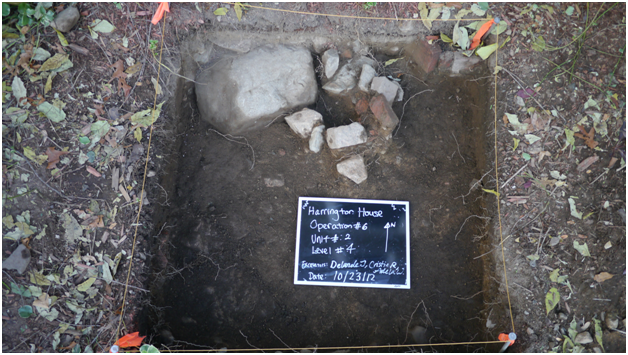 The Harrington House has a two-room central chimney layout, meaning one chimney heated the entire house through two rooms on the first floor and two rooms on the second floor. 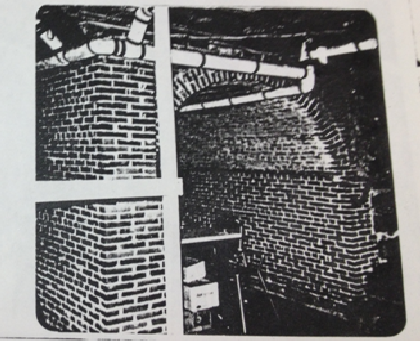 The barrel-vaulted chimney foundation seen in the photographs was constructed to support the two-story tall flue. 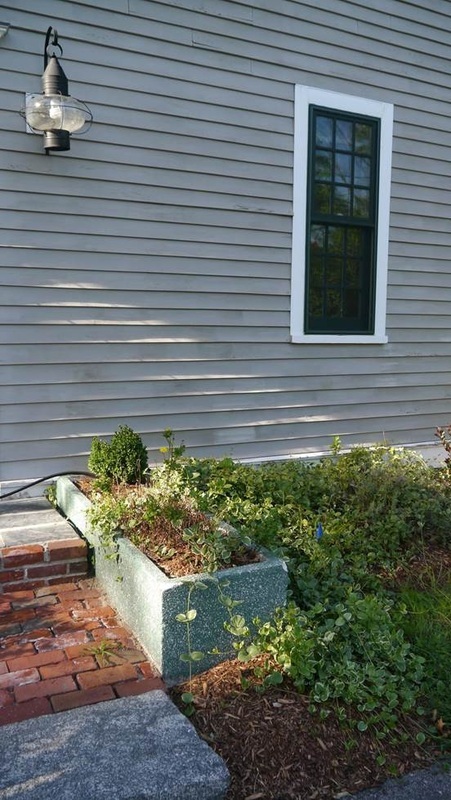 This is a design from the Second Colonial Period in American architecture (1700-1770), which supports the claim that the house was built in the mid-1700s. We found over 144 brick fragments, varying from small pieces that were no bigger than your fingertip to some pretty sizable chunks (no whole bricks were uncovered in our unit). 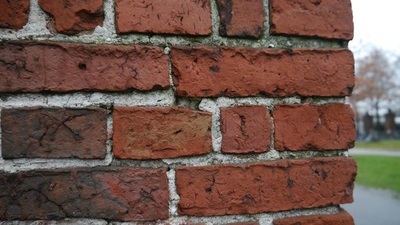 Eager to see if brick size could help us determine the age of the buildings, we embarked on a journey to Cambridge and Boston to investigate the buildings constructed in the 18th and 19th centuries. 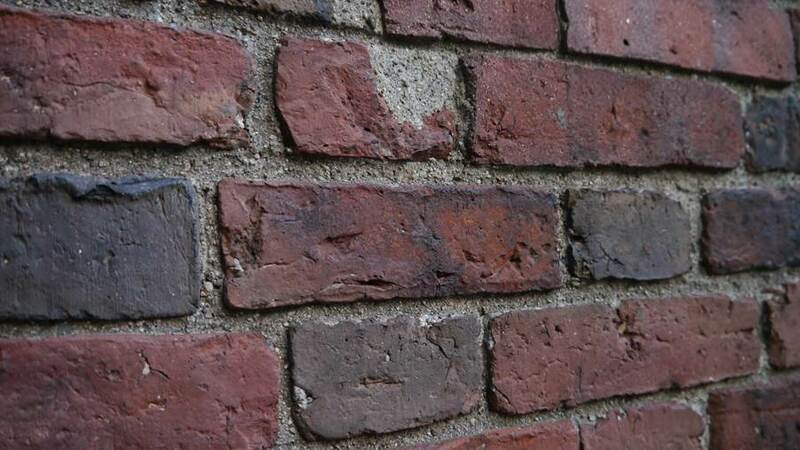 These buildings are fairly well-preserved and are within 10 miles of Waltham, so we were curious to see if brick size had been standardized at all. 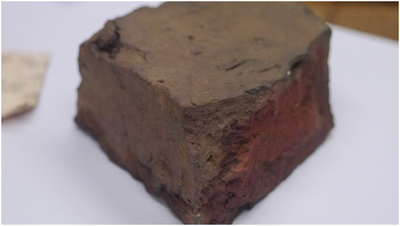 The bricks found in the foundation of the house closely matched those found at Harvard Hall in width and length, approximately 9.5cm and 18cm, respectively.